Greeting Card Sales Have Stabilized, Thanks To Millennials Greeting card companies have weathered some tough times as more people send good wishes online. But millennials are purchasing more cards, which has helped stabilize the industry. With increased channels of communication, millennials find that cards symbolize effort and send them for "cardworthy" occasions. This Valentine's Day, the greeting card industry is healthier than you'd expect. While email, texts and social media companies from Facebook to Snapchat have made it easier than ever to send instant greetings, more people — especially younger people — are sending greeting cards. Over the past year, greeting card revenue has been steady. 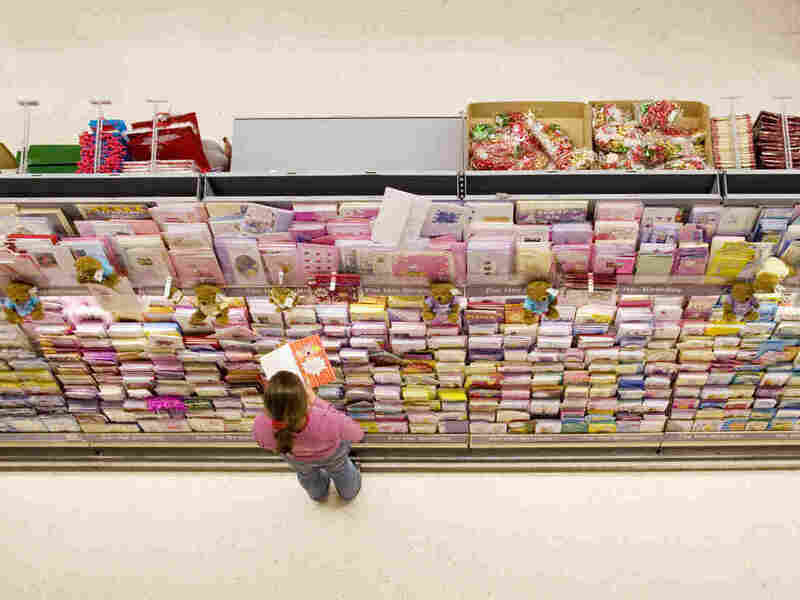 The greeting card industry could bring in as much as $933 million this Valentine's Day, up a bit from last year's estimated $894 million, according to the National Retail Federation. Greeting card experts say it's younger people and millennials, in particular, who have been keeping the industry afloat. And they're buying fancier specialty cards, often with personal touches. "For Valentine's Day, I got my mother a pop-up card that had a little cartoon that jumped out like it would give you a hug with a speech bubble that said, 'I love you,' " said Ben Leeper, 22, of Leawood, Kan. Valentine's Day is the second biggest holiday of the year for greeting cards. But millennials are also buying cards for birthdays, for anniversaries and even to congratulate friends on taking medical school exams. These are the kind of "cardworthy" events that the Greeting Card Association has noticed are popular among millennials, said its vice president, George White, who is president of Up With Paper, an independent stationery company in Mason, Ohio. But some people just like sending greeting cards. Leeper sends a lot of thank-you notes as well as "just because" cards to friends nearly every week. He buys them when he goes grocery shopping. There's very little overall current data for the greeting card industry. Most in the industry tout this 2012 report that 6.5 billion cards are bought each year. But the industry had been struggling for years, especially as social media and e-greeting cards took off, Greeting Card Association officials said. In 2013, the No. 2 company in the industry, American Greetings, had been struggling so much that the firm, which was formerly publicly traded, went private. And over the past decade, the number of letters and cards sent by U.S. mail has fallen consistently each year. However, a recent report on the greeting card industry by AnythingResearch shows 3 percent growth in revenue last year (although the same report forecasts declines in years to come). Millennials are also embracing newer digital greeting card apps that allow people to send personalized cards with a click of a button. Mobile apps Felt and Postable both allow users to upload a picture from their phone and write a personalized message in their own handwriting. And then the companies mail the greeting card to the recipient. Young people are also shopping for greeting cards from some of the big photo-printing companies, such as Shutterfly and Vistaprint, that let people upload personal pictures to customize stationery and greeting cards. Is It Time To Write Off Checks? And then there are the millennials who are getting in on the greeting card industry. 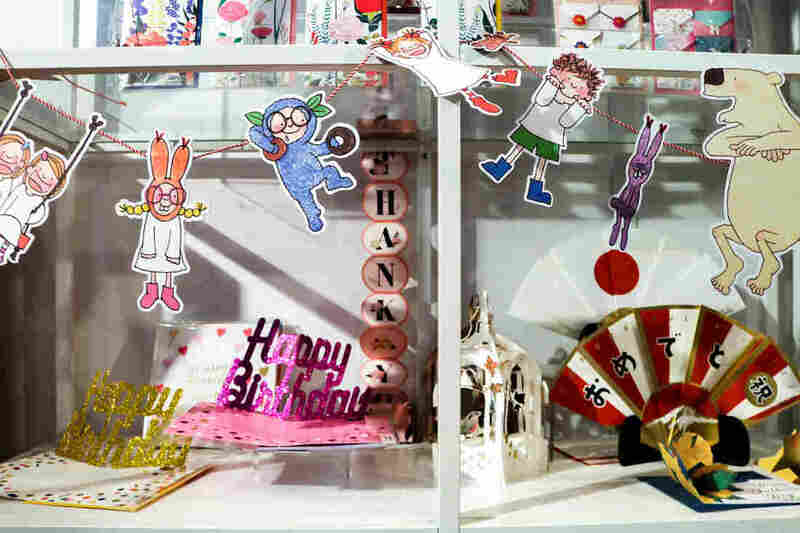 More young people are starting their own companies that make new kinds of cards that feature pop-up 3D images, hand-painted artwork, LED lights, sounds and even animated cartoons that can be accessed with a mobile phone. Their goal is to create a more personalized experience and make cards that are more relatable to younger people. Victoria Venturi is the creator of Paper Epiphanies in Portland, Ore. Her cards feature messages such as "Grateful AF" and "I think we're related somehow, Merry Christmas!" "When I started the company, I thought there was a real lack in the industry of cards that spoke with the words that I use with my friends and my peers," she said. Barrie Lazarus just launched a greeting card company that sells cards with folding paper layers that reveal different messages or witty jokes. "I've loved greeting cards since I was a child. I never throw them out if I receive one," she said. Lazarus wants young people to appreciate the value of physical cards. "I want to make America greet again," she added. As more millennials try to bridge the generational gap to make cards that resonate with their peers, it's starting to bolster sales. But these cards are more expensive. And so millennials are buying fewer greeting cards as a whole compared with other generations. Basically, they're not buying boxes of cards to send to 50 friends around the holidays. Instead, they're spending more on each fancier, higher-quality card. Take Yoomie Huynh, who just last week spent nearly $8 for a pop-up card featuring a fancy car to congratulate a friend who is getting married. "I like giving cards because you can hold it, unlike a text or email," said Huynh, 38, of Takoma Park, Md. But the higher prices are not going unnoticed. Twitter is full of enraged greeting card customers. Greeting cards have gotten ridiculously expensive. You know what costs $5 and expresses love/affection/appreciation even better? A glass of wine. But some greeting card lovers are just fine with the price. Brittany Williams, 23, of Fort Washington, Md., was browsing a Papyrus stationery store in downtown Washington, D.C., the day before Valentine's Day. "I spend $10 at the most on a card," she said. "I really like the funny ones and the ones with voices." A previous version of this story misspelled Victoria Venturi's last name as Vanturi.